‎The Enugu State born Beauty Queen has been listed as special appearance for the Nigeria’s historical celebration today even though she has long stopped parading herself as the reigning Miss Independence Nigeria after the unfortunate misunderstanding with the pageant management. As Nigeria celebrate Independence Today, Queen Nneze Richards was received at the Aso Villa yesterday by the ‎Senior Special Assistant to the President on political matters Rt. Hon. Gideon Samani as they prepare for today’s celebration. Her possible confirmation is on the premise of her individual antecedents and outstanding roles and activities she embarked while she reigned. She is expected to release a stunning individual Independenc‎e photos to celebrate the nation and wish her teeming fans best regards. 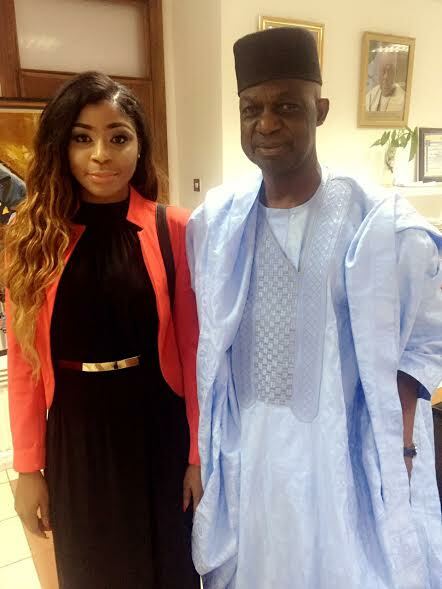 It would be recalled that she remained the first national beauty queen to be hosted in the Villa by APC led administration when she was received by Mr Femi Adesina, SA to the President on Media and publicity. Speaking to the press last night, the Chartered Accountant ‎graduate commended the Nigerian police for ensuring peace and tranquillity in times like this. She particularly commended the former Inspector of Police, Solomon Arase pictured with her for his role In maintaining peace during Nigeria’s 55 Years independence anniversery last year, as she expects peace in today’s epic celebration as the country Banquet Hall in the villa.